Summertime is a great time for dogs of all ages. Whether at home or on holiday, it is surely the best time of year to be enjoying the Great Outdoors and all it has to offer. From picnics in the park to days at the beach or long country walks, you and Fido will have a ball. However, while it’s been drummed into us humans to be sun savvy, our pets may find it hard to recognise the dangers of the sun. Dogs, for instance, don’t sweat a lot so cannot cool down that way. Instead, they pant to keep themselves cool. However, when there’s only hot, dry air to breathe, this is not particularly effective either. As a responsible pet owner, it’s up to you to make sure your dog is both safe and comfortable during the hot weather. Learn to recognise the danger signs and take a look at these important summer pet safety tips. It’s been said many times before but the message is so critical that it can’t be repeated often enough. Did you realise that it can take as little as a few minutes for a dog to develop heat stroke and suffocate in a hot car? Most people probably have no idea how hot it can get in a parked car – up to 30C in the shade and a staggering 70C in direct sunlight, even with the windows left open! Signs of dehydration in your pet include lethargy, shallow breathing, dry gums and sunken eyes. Plenty of water and the immediate removal to a cooler environment are the first line remedies but if that doesn’t do the job, you may need some specialist vet supplies. Dogs with flat, wide skull shapes such as pugs and bulldogs are most at risk from overheating. 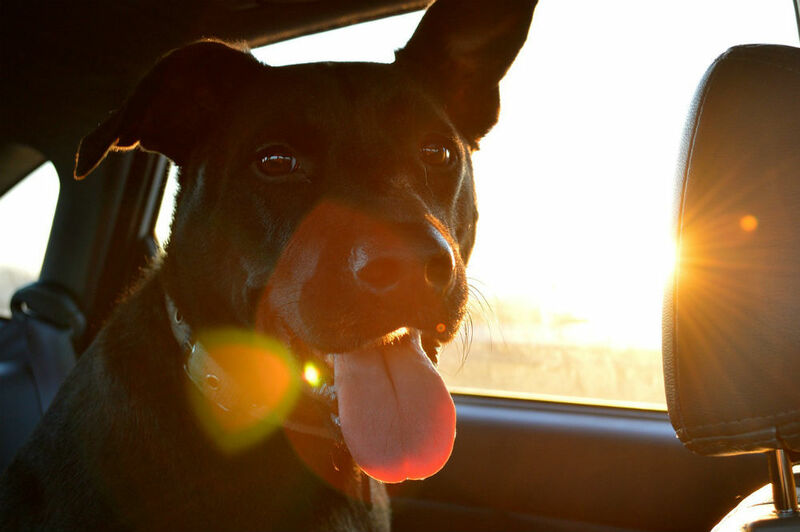 If you must take your dog out in the car on a hot, sunny day, bring water and a water dish for your pet, and for goodness’ sake take Fido with you when you park the car. Wherever you are during a hot day, there should always be fresh drinking water and shade available for your pet. 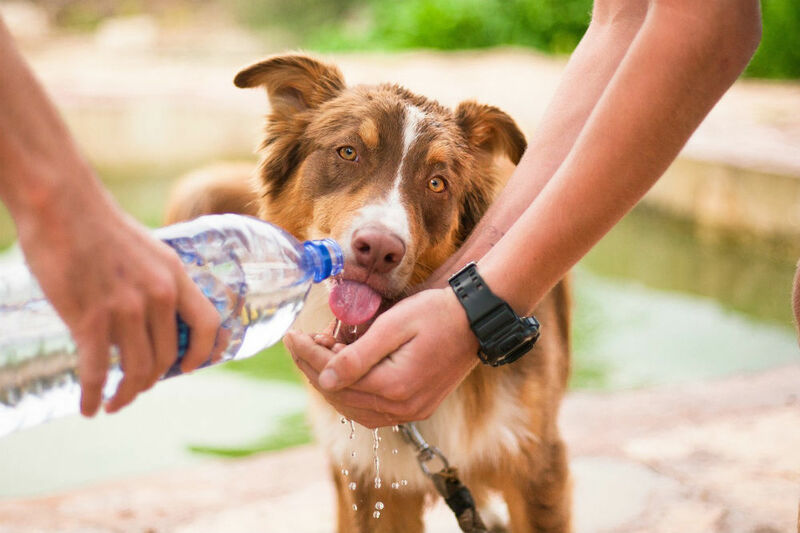 As already mentioned above, dogs get really thirsty in the heat, much more than humans. The only way they know to cool down is by panting and drinking a lot. 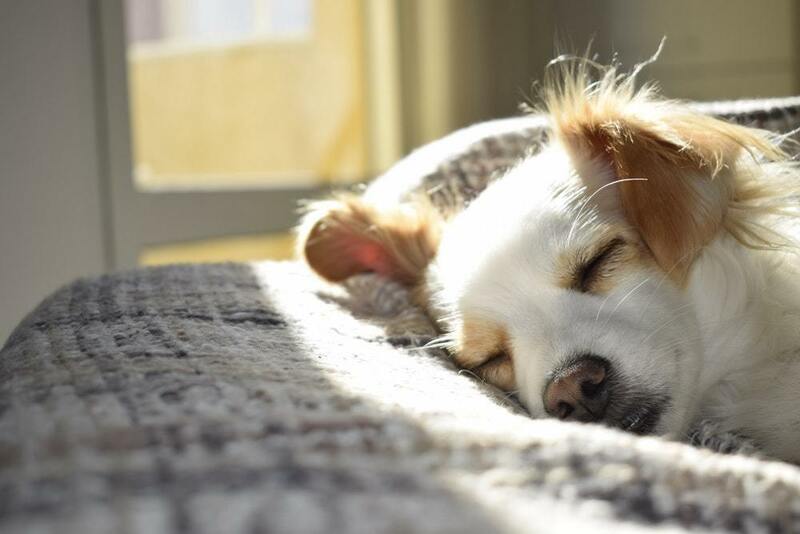 Even if your dog loves sunbathing, it’s highly recommended that you keep him in the shade during hot temperatures to avoid the dangers of heat stroke. If your dog loves water, why not invest in a cheap kids’ paddling pool for the garden? Fido will have lots of fun splashing about while keeping cool. When you’re out and about, spare a thought for your dog’s paws on the hot pavement. Not only can the hot asphalt burn the skin on the underside of the paw, it can also increase your pet’s body temperature and make them overheat. Did you know that dogs can get sunburn? Breeds with short or light coloured coats are particularly at risk of overexposure to the sun which, just as in humans, can lead to skin cancer. Talk to your vet about specific sunscreen products for dogs. Swimming is a great exercise for your dog, and many dogs adore them. However, contrary to popular opinion, not all dogs are naturally competent swimmers. Just because they instinctively seem to know what to do to keep afloat, and may enthusiastically launch themselves into the nearest pond, lake or sea, it doesn’t mean they’re good swimmers. Don’t leave your dog unattended around water. He may be struggling to get out of the side of a pool or up a ladder without help. Even good swimmers are at risk of drowning when they get exhausted and cannot find a way out. If Fido has been swimming in chlorinated water, it’s a good idea to give him a quick shower to remove the chlorine. Otherwise, the chemical can dry his coat and, if he tries to lick himself, may make him sick. Check your pet’s ears after he has been swimming to make sure they’re not waterlogged. Dogs are susceptible to ear infections which may require medication or a trip to the vet to be cleared. If your dog shows signs of skin and paw irritations, watery or itchy eyes or an ear infection, he may have developed an allergic reaction. Your vet is the best place to seek advice, check him out and obtain a canine antihistamine. Stagnant water is another potential risk for your four legged friends. The bacteria that causes leptospirosis can enter through broken skin as well as mouth, nose and eyes, and it can be transmitted to humans and other animals. Children are most at risk. Finally, summer is the time when parasites like fleas, ticks and mosquitoes are most active, able to spread potentially serious diseases including Lyme Disease, Heartworm and other nasties, many of which can be caught by humans too. Is Your Dog Safe From Fleas and Ticks?